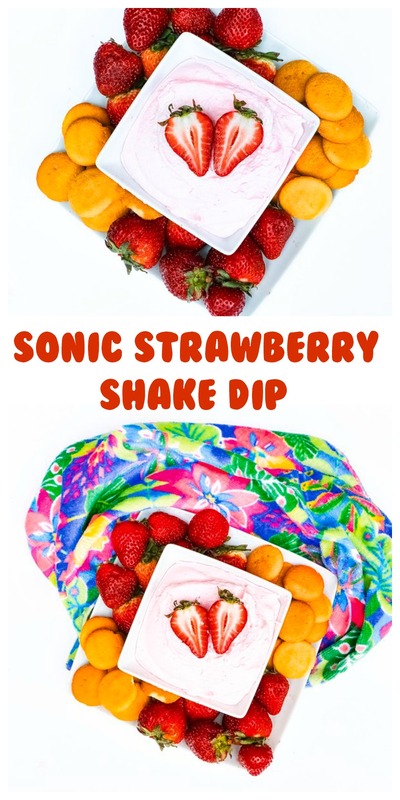 This Sonic Strawberry Shake Dip is the best thing you will eat all summer! For years and years and years we’d see Sonic commercials here in Boston, but there were no Sonic’s to be found. And then one finally opened in Massachusetts – Only it was all the way up in Peabody, which is about an hour from where I live. It was kind of a bummer, but I did manage to make it up there a couple of times. But then a couple of years ago one finally opened near me, in Somerset and now there is one in Stoughton, too, so now I can have Sonic whenever I want since I can get to one in about 20 minutes. YAY. One day recently I was at Walmart and came across Sonic Pudding and I was like woah….I knew I needed to get some and make something awesome out of it. Cue this ah-mazing Sonic Strawberry Shake Dip. It’s so easy to make and it’s super yummy. 1. Pour the entire container of whipped topping into a large bowl. 2. Pour 1 cup of milk into the large bowl (this will eventually thin out the dip!). Be sure to mix well. 3. Pour your package of Sonic Strawberry Shake Pudding Mix into your bowl. Your mix will pour white and then turn pink when you begin to mix. 4. 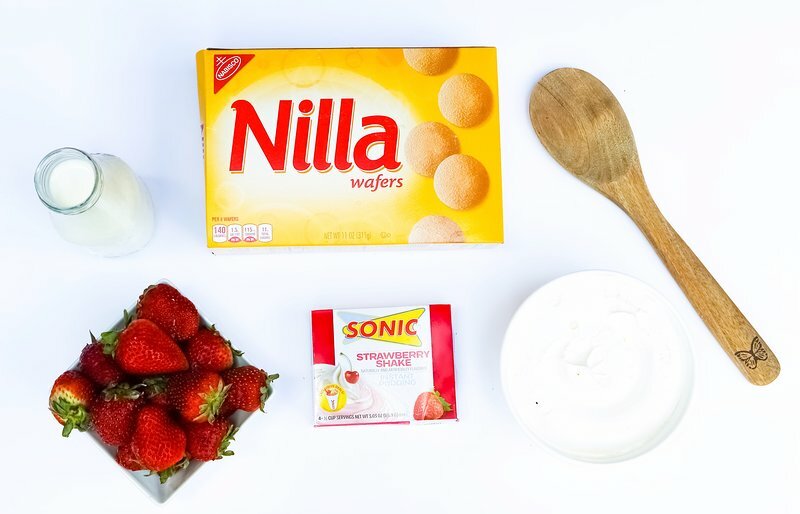 Pour your Sonic Strawberry Shake Mix into a serving bowl & spread out all your favorite dunkable snacks (I used Nilla Wafers and strawberries, but you can use whatever you like best). 5. 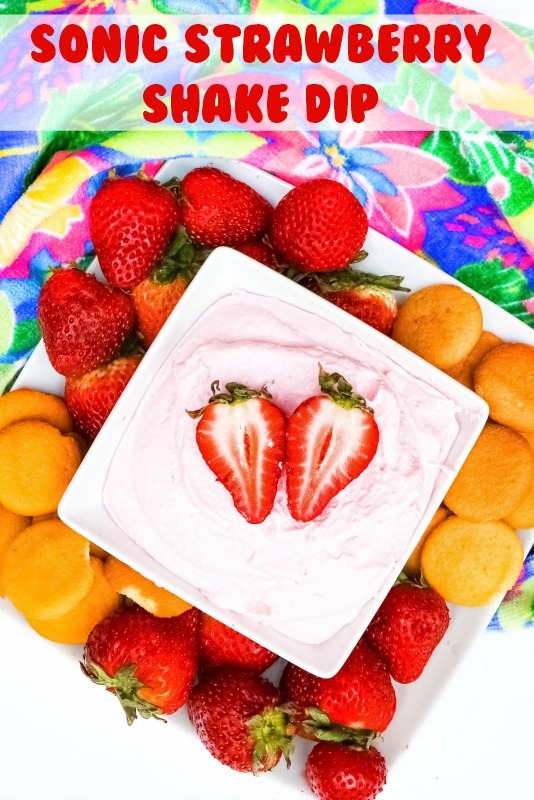 Cut a strawberry in half and place it on the top of your dip for garnish. 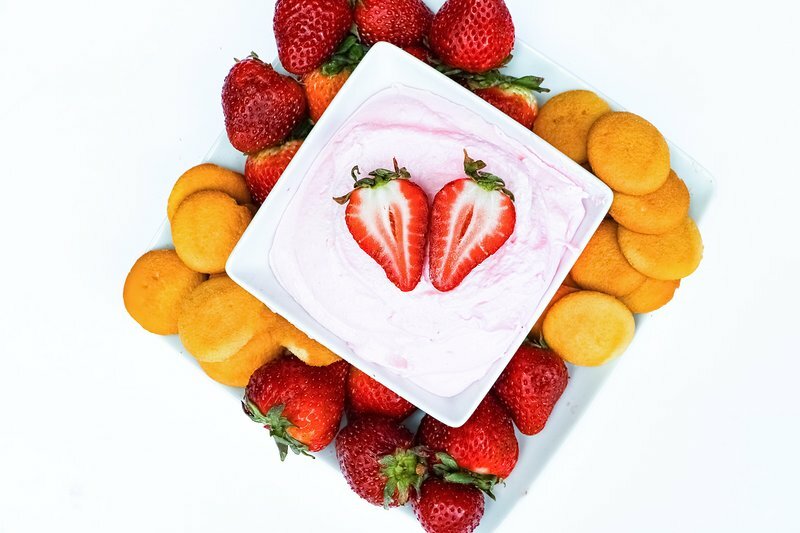 Dontcha just love how easy this Sonic Strawberry Shake Dip is to make? Bring it out at your next party or cookout and it’s pretty much guaranteed to be the first thing to go! 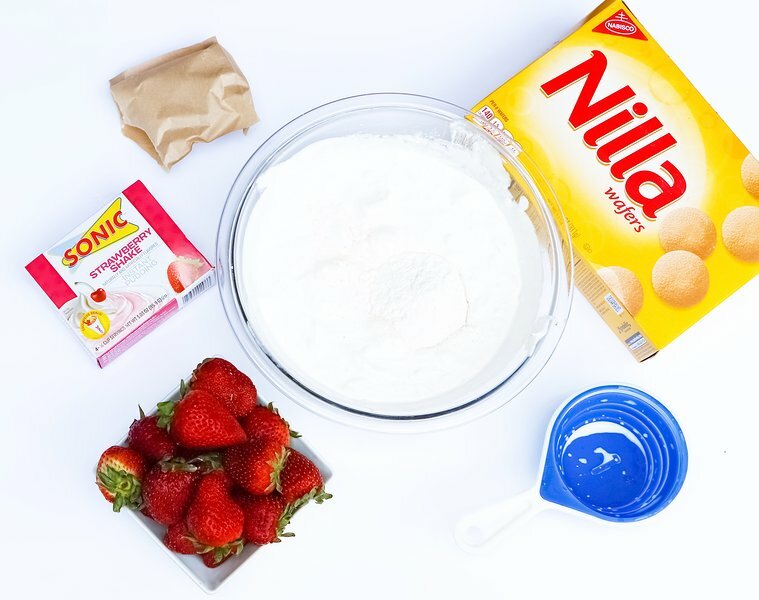 I hope you get a chance to make this Sonic Strawberry Shake Dip soon. You’re going to love it. I haven’t seen this pudding yet! I must get this ASAP and make your easy peasy dip! I love the Sonic pops in the freezer section at Walmart, but I have to head to the pudding aisle next time I’m grocery shopping. I am all over this. Yummy. I love vanilla wafers. My favorite cookie! Can’t wait to try this. I didn’t know there was Sonic Pudding so I will have to look the next time I am in the store so I can make this for my husband. As we all love Sonic and I would eat there every day if I could. Now that is a dessert! Strawberry is my favorite flavor, and I love making desserts like this. I think this one is going to go over really well at my house. This looks a delicious recipe. If I had little kids I’d make it for a special back to school treat. Strawberries are one of my favourite fruits! I remember as a kid we would make a strawberry dip and layer it into sponge cake and it was soo good. Yum. That looks to be a great use of strawberries. I know my kids would love something like this. Well, this must be new b/c I haven’t seen it in stores. So Sonic is venturing out – good for them. It truly looks yummy. That pudding mix sounds interesting. We’ll have to look for it the next time we’re out. I love this recipe. Perfect dessert after a day of strawberry picking. This looks so good! Sonic makes some of the best shakes I have had, too. You really nailed this one. My kids will flip out for one of these. That’s a delicious sounding dip. I didn’t know Sonic sold packaged foods. Awesome! We love Sonic around here, but I’ve never seen this Sonic pudding. I need to go and find myself some. yea, i need this in my life. looks amazing! This is a cool way to serve Sonic. I love strawberry flavored anything and I’m pretty sure this is going to be a hit at parties as well. Thanks for the awesome recipe! I could eat this by the spoonful! Would love to give this a try! I am Sonic obsessed! There are several right around me but I would love to try the pudding mix!! My family loves Sonic. I can’t wait to try this. It looks so yummy. Perfect of summer! This dip sounds so delicious. I would love to try this recipe and dip some apples or graham crackers in this! So fun! This dip looks like it would be so good. I really need to give this a try! I am sure that if I make this at home, my kids and my husband would be in dipping heaven. Thanks for sharing the recipe. I will have to look for the Sonic Strawberry Shake pudding mix when I do my grocery shopping this weekend. I had no idea they sold that! I need to find it and make it asap. Yum! Wait! What do you do with the chocolate chips? Sonic is my favorite burger place but I had no idea they made pudding mixes! The Grands will be loving this one. Actually, Babushka will probably be making 2 batches at the same time- one just for Sweetie. ; ) Pinned. This is beautiful. My kids and I love strawberries.